Do you want to reduce inventory waste? Focus on your company's growth? Would you like to manage your costs, pay for only the product you need, and ensure compliance with your corporate purchasing rules? PFL's Fulfillment Services can help you do all that and more, protecting your branding standards while serving you and your company's individual needs. Who's got room in their day to put together all the components of a killer promotional package that incorporates various print and promotional items? We do! 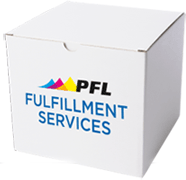 PFL's Fulfillment Services can kit, assemble, and bundle to save you time and money. Send your clients your branded gift box filled with healthful snacks or a promotional mailer that contains your business card, stickers, postcards, or a refrigerator magnet... It's up to you! Want to target key demographics but aren't sure where to start? Our direct marketing professionals will help you get counts and route information for Direct Mail and Every Door Direct Mail® campaigns that will lead to higher market shares, help you measure ROI, and generate efficacy reports. If your organization, corporation, or political cause has special project management needs, PFL can help you get the most out of your promotional or educational mailing campaign fulfillment. We all know how important timing and accuracy can be in any marketing campaign, and both factors can be vastly improved through proper scheduling and targeting. PFL's database management assistance teams will work hard to get you better returns through intelligent data analysis. Or fill out this form and we'll contact you with more information.